We put some F-Zero in your F-Zero so you can crash horribly while you crash horribly. First, a brief history lesson: Back in 2003, Nintendo released two F-Zero games. The first, F-Zero GX, landed on the GameCube, where it eked out a reputation for being both gorgeous and bastardly hard. 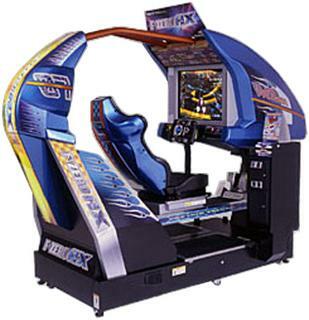 Slightly less well known is GX's sibling, F-Zero AX, an arcade version of the game that ran on the Triforce arcade system board (which itself was basically a souped-up GameCube. The games were partially cross compatible; players could unlock extra tracks for GX by taking their GameCube memory card to an AX arcade machine. Oddly enough, not only were the AX tracks already on the GX disc - presumably making the title one of the earliest examples of on-disc DLC - a full version of AX was included as well. A modder going by the name of "Ralf" discovered the hidden game - to be clear, this is actually the full game, not just the extra tracks - using an Action Replay cheat device. Using the codes detailed here, players can boot AX and enjoy its traditional coin-op mode. The code was discovered late last year and was publicized today by RetroCollect. While there's plenty of copies of GX floating around in the wild (I think there's at least three in the Carter household), AX is much rarer on account of it being a honking great big arcade machine. This is great news for collectors or F-Zero enthusiasts who don't have a spare garage for storing bulky gaming cabinets.